Sometimes a pet will scratch at its ear and end up with a swollen ear. This condition called aural (ear) hematoma, and it is basically a large blood blister of the ear flap. This condition is seen in both dogs and cats and may be the result of head-shaking due to an ear infection, ear mites, or itchy allergic ears. The ears of dogs and cats are composed of three layers: skin, cartilage, and skin. The ears have many blood vessels. With damage to these vessels, blood seeps in between the skin and cartilage, forming a blister on the ear flap. The aural hematoma may involve part of the ear flap, or the entire ear flap, sometimes blocking the ear canal. A history of an ear infection or itchy ears is most common, but not always the case. The cause could be from head-shaking due to ear infection, grass awn and foxtail, allergies, ear mites, or nearby hot spot irritation. In some cases, the cause remains unknown, possibly an autoimmune or bleeding disorder. 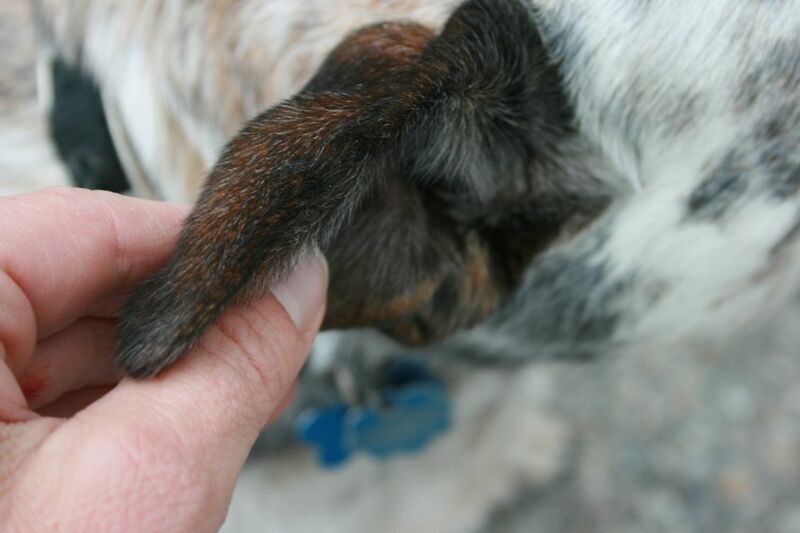 The ear flap is usually turgid (fat), and warm to the touch. It is uncomfortable at best, and probably painful. The animal usually tilts the head toward the affected ear, and often shakes the head. This can cause more damage or possibly rupture the ear flap skin. You might introduce infection. Bacteria thrive in this warm environment of blood and clots and even with sterile technique they can migrate into the wounded ear area. If the blood does drain (which may be difficult due to clot formation), it will likely fill right back up again, creating more trouble. The underlying cause must be addressed, or this will be a recurring problem. Without treatment, it takes weeks for the body to resorb a large hematoma, which is uncomfortable for the pet and will result in a crumpled ear, also called a cauliflower ear. Until you can see the vet, try to keep the ear clean. If your pet has been under treatment for an ear infection, use the previously prescribed ear washes and any ongoing medications. Some dogs will tolerate a loose head wrap to prevent further head-shaking damage, but struggling to get a bandage off will make things worse for many dogs, so owner discretion is advised. Your vet will also initiate proper medical therapy and treat the underlying causes. If you suspect that your dog or cat has a hematoma, while not usually an emergency, please contact your veterinarian as soon as possible to discuss treatment options and prevention.